Each of the two organic shaped earrings is cut out of 1mm sterling silver sheet. Both earrings have been sand textured by hand and then reticulated by hand. 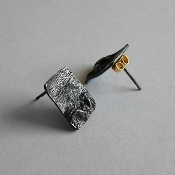 Each heavily textured and blackened slightly irregular earring is unique and measures around 1cm x 1,5cm. Stoppers are made of 18K yellow gold. Backs are laminated in non toxic bio resin which makes them extremely strong and durable. Very lightweight and comfortable to wear!